Hao Wang successfully defended his Ph.D. dissertation. Congratulations, Dr. Wang! Ren lab received a new NSF/FDA grant to visit FDA and collaborate on biofilm research. Katherine Ann Gardner won 2nd place at the 2018 ECS Leadership Scholar REU Pogram poster competition. 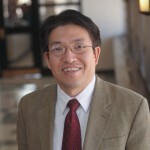 Dr. Huan Gu is appointed as Assistant Research Professor. Understanding and controlling microbial biofilms to promote basic science and knowledge-based technology development in the fields of disease control, bioremediation and sustainability.